Several weeks ago, I was lucky enough to win a personalized badge from the wonderful Erica M at Yeah Write in celebration of their 100th writing grid! I was totally excited to win (who doesn't like to win??) but I had absolutely no idea what I would need a badge for. I hemmed and hawed and almost considered an alternate prize, but then it hit me! Have you noticed nobody says that anymore? Why is that? Basically, the things I admire and aspire to. In this first installation, I'm giving out my Thumbs Up badge to the very same Yeah Write site that gave me this prize. Seriously, how awesome is this badge?? Now it may seem a bit seedy to give my first badge to the site that created it, but they truly deserve it. Since joining their writing grids I have become an even more conscientious storyteller, have discovered some amazingly written blogs, and a great community that is supportive and fun! Thanks Yeah Write, for making me a better blogger! 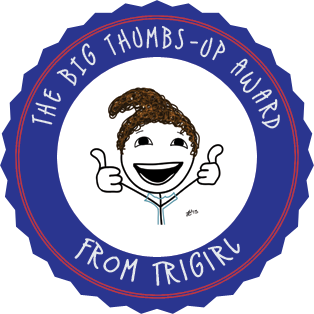 I will give this badge out every once in a while, so stay tuned...you just might find yourself with a thumbs up of your own to put on your blog! *If the picture in the badge looks familiar, you may be thinking of last week's post. UPCOMING POSTS: SWIMMING, A HALF MARATHON RECAP, ANOTHER 'RANDOM THOUGHTS WHILE RUNNING' POST, AND I WILL BE GUEST POSTING AGAIN SOON!